The Young Farmers’ Clubs of Ulster has voiced its support for the upcoming cross community charity tractor and vintage run which will raise funds for the NI Air Ambulance. Commenting YFCU president, James Speers said: “It is great to see Torrent Valley Complex recognising the vital and lifesaving service which the NI Air Ambulance provides for members of rural communities. He added: “It is great to see community groups like Torrent Valley Complex in Donaghmore also supporting and fundraising for the same charity. The group will hold its second consecutive cross community tractor and vintage run on Saturday, June 30. 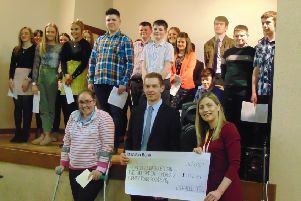 Money raised this year will be split evenly between five local organisations and charities, The Lollipop Play Group, Donaghmore Primary School, St Patrick’s Primary School, The Air Ambulance and Craigavon ICU.